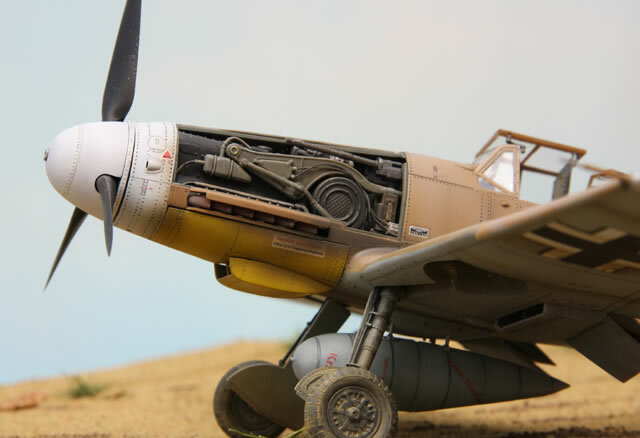 As good as some aircraft were considered to be in the arena of combat, without the human element, they are merely hardware. All the biographies I’ve read demonstrate that tactics, courage, skill and luck are as important as anything else. Based purely on performance though, their was no contest when comparing these two, which no doubt locked horns many times in the wretched North African campaign. 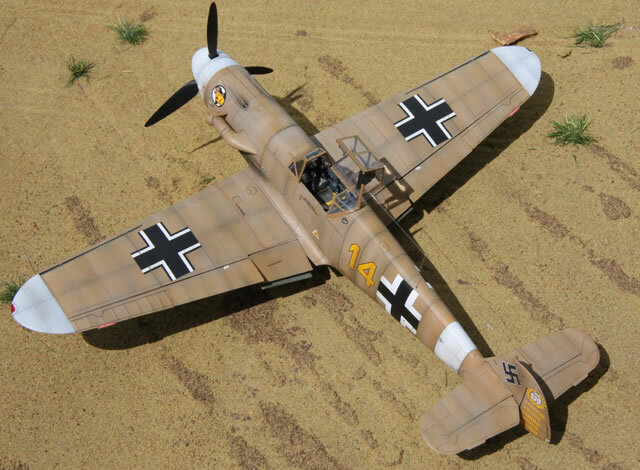 The F-4 version of the famous Messerschmitt was considered to be the best dog fighter of all the 109 variants. 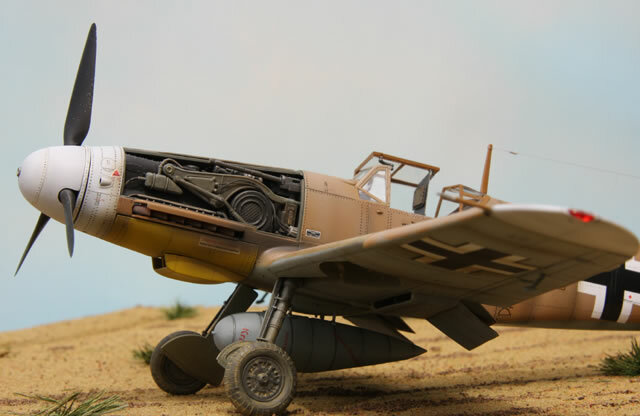 Though considered under armed, this short coming evidently did not disadvantage Hans Joachim Marseilles. 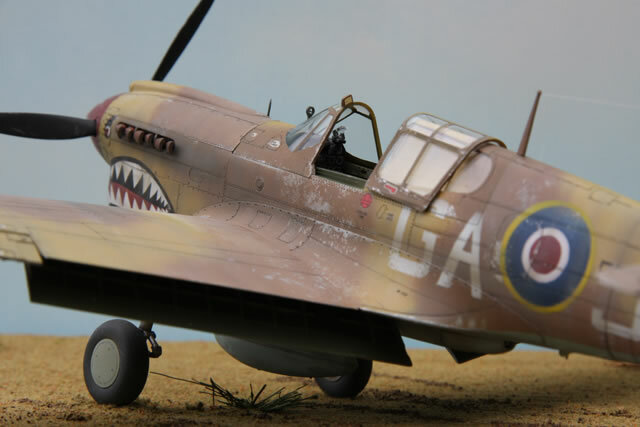 At the same time, Australian P-40 ace Clive Caldwell, who some say was the true Allied top scorer, more than held his own against the daring performance of the German mounts. This is the standard F4 kit by Trumpeter. 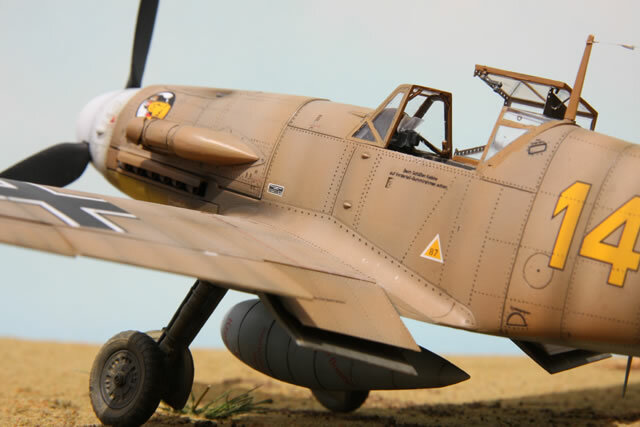 The decals are from Eagle Cals, the sheet contained 4 different planes, brightly colored in typically flamboyant Luftwaffe fashion and beautifully rendered. The choice was difficult, deciding in the end to do my own little tribute to arguably the greatest ace that ever flew, Hans Joachim Marseilles. The only modifications I made were scratch built, that is the tropical air filter and long range oil tank in the engine bay, along with some plumbing. 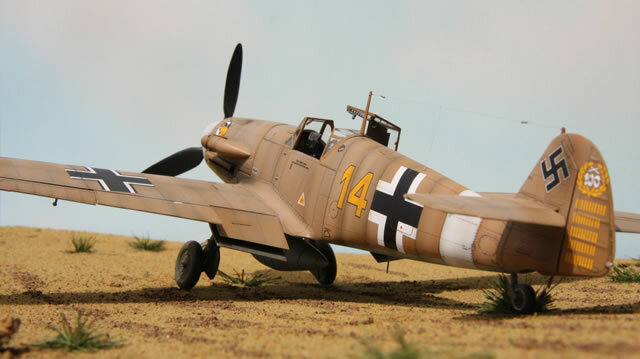 This is my second Trumpeter model and I think it’s a very fine kit, with good detail, particularly the cockpit and canopy. The surface is quite elegantly sculptured. I’ve depicted here, the final aircraft that Marseilles flew, ultimately to his unlucky demise. He was given a new plane every few months or so; as you would with your best men. This version was fitted with improvements that were not scheduled for production until the G model. 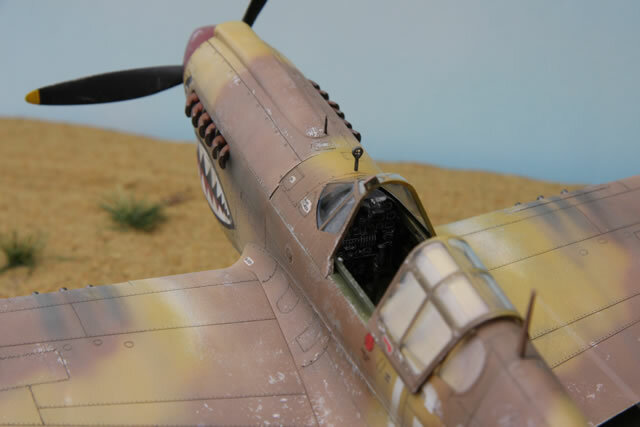 I decided to weather the aircraft lightly, though in desert conditions I don’t think it would look good for too long. A straight forward build, a simple paint job, but very enjoyable all the same. 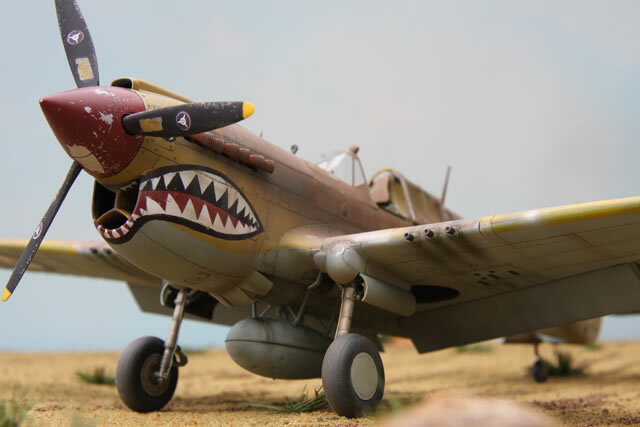 Whilst it doesn’t take the credit as the first aircraft to sport the sharks teeth insignia, one cannot argue that the P40 wore them better than any other plane, and to me they don’t look quite right without them. To my surprise, I couldn’t find a desert version in 1/32nd scale. I decided to grab a kit anyway and find some after market decals. Hasegawa’s kit is exactly what you’d expect from them; simple but nicely done. 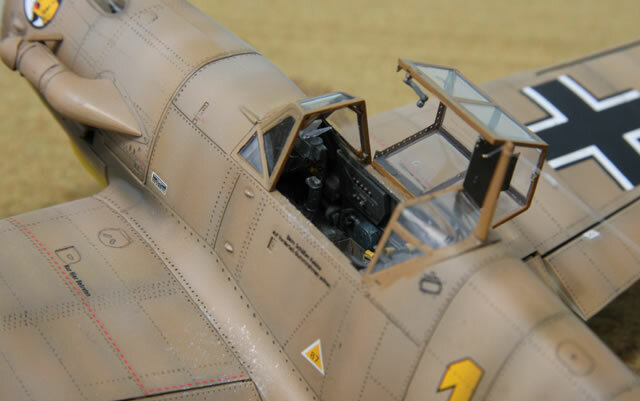 The only addition to the stock model was a photo etched harness from another kit. 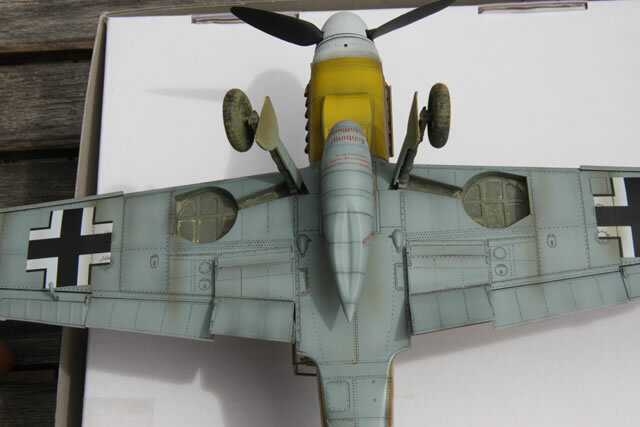 I couldn’t find a decal set for the long fuselage version though, so I made the decision to attempt the markings myself, a touch on the ambitious side for a person of my limited skill, but I suppose that’s how one gets better at this. I was expecting the teeth to be the hardest part, but they were the easiest because it’s not a symmetrical figure. The roundels were the most difficult. I couldn’t find any tool that would allow me to cut out perfect circles of varying diameters, so I cut the masks created by printing straight onto Tamiya tape by hand, very, very slowly. The next problem was the colors. I got the blue pretty good, but the red turned out a touch on the dull side. 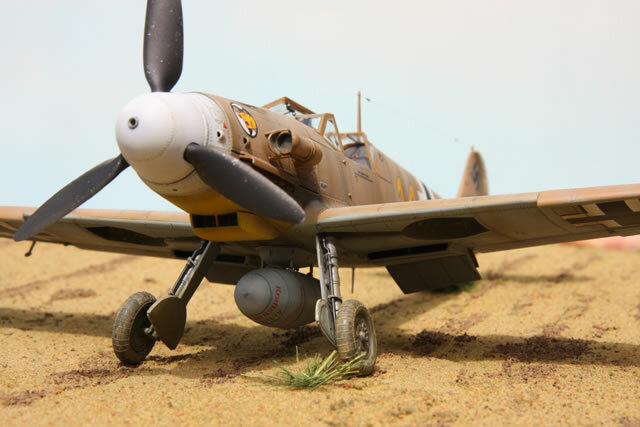 I weathered the kit heavily, to the point where I tried to make it look as though sand kicked up by the prop blast had worn some paint off the wings, to quote Pierre Closterman from his book ‘Flames in the Sky’, ‘sand would strip the paint from wings like emery paper’. The flat earth/middle stone finish on British aircraft operating in the Mediterranean and North Africa bore red spinners. 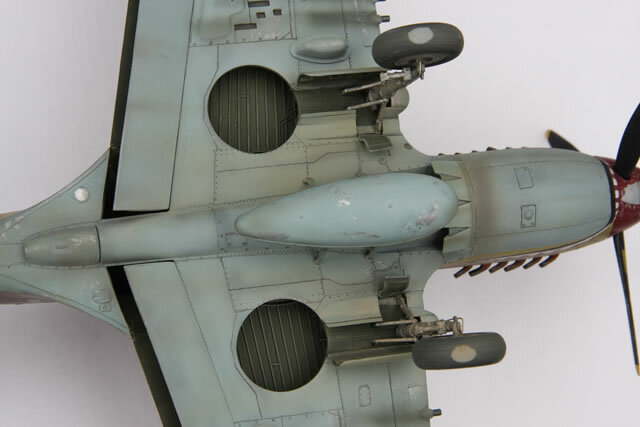 Interestingly, the reference photos I uncovered shows this red color to be the same as the roundels, rather than the brighter red seen on many models. This would seem logical, although I can’t say for certain whether the photos are genuine or colorized black and whites. 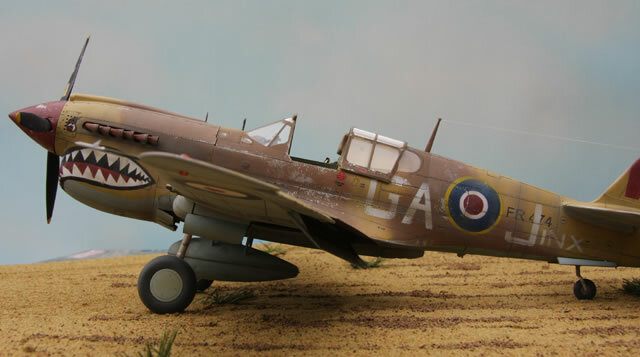 There were many inconsistencies in my research of the aircraft I’d chosen, serial number FR474, flown by Flying Officer Maurice Neville Mathias of 112 squadron based at Bir Dufan, Libya in 1942. Some references depict FR474 as a standard Mk 3, others show it to be the variant with the extended dorsal fin. 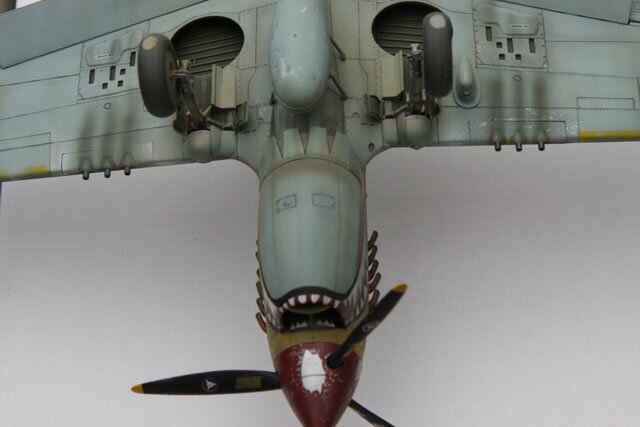 There are also question marks around the shape of the sharks teeth, yellow wing stripes, engine cooling vents and radio wire. The best I could do therefore, was extrapolate as to what FR474 may have looked like. I’m pretty happy with the result and both of these models seem to photograph well.